I had the pleasure of entertaining someone special tonight. Big Sister Madam has been out of town for a while, and I felt pretty privileged when she agreed to let me take her out for dinner over a bottle of wine. Having been responsible for introducing Big Sister to On Lot 10, it was no surprised that she requested to go to Neighborhood. It's actually been a while since I was last there, and I was ever so happy to show my friend David Lai some love! Rocket/pigsear salad - I wanted something with veg, and at the same time I could never resist the lure of pig's ears... especially when there are also croûtons and chopped bits of lardon thrown in. Love the sharp acidity here. Wagyu tartare/oyster aioli - very interesting presentation... but it made sense given the oyster aioli. The texture here was much finer than the hand-beaten beef tartare that David used to serve at On Lot 10, and I really liked having the oyster flavor come into the mix... because it kinda throws you off, but in a good way. Add some chervil and black truffle shavings, and croûtons for texture, and you got yourself a pretty tasty dish. 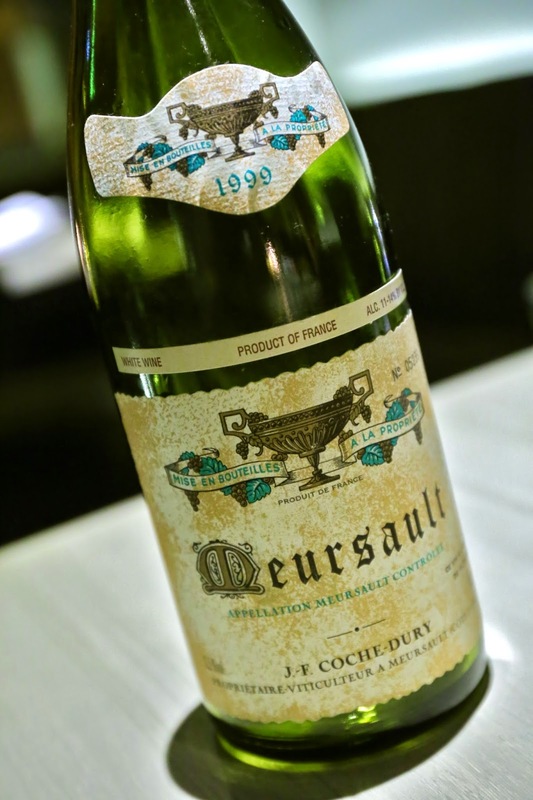 1999 Coche-Dury Meursault - served warm at the request of my friend, which opened up the nose but also meant the palate was less crisp, resulting in a slight bitter finish. Nose-wise this was classic Coche-Dury, with plenty of toasty oak, roasted corn, and buttery corn. Always a beautiful wine.